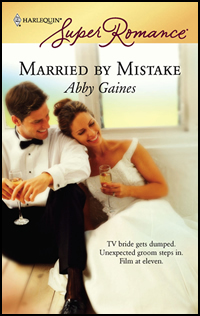 Casey Greene, tired of being a pushover to the people she loves, lures her procrastinating fiancé on to a surprise wedding TV show—so she has only herself to blame when he jilts her in front of millions of viewers. Cynical TV station owner Adam Carmichael is an unlikely rescuer, but his plan for a fake wedding is the only way for Casey to avoid total humiliation and Adam’s company to hang on to a valued sponsor. But when a quirk of Tennessee law makes their marriage legit, things go from bad to worse…. The bride wore a long white dress and a look of utter despair. Adam Carmichael saw her through the glass wall of the Memphis Channel Eight boardroom, scurrying down the corridor as fast as the full skirt of her dress would allow, flicking furtive glances over her shoulder. Damn, a runaway bride. Could this day get any worse? He stepped out of the boardroom, and she saved him the effort of stopping her when she cannoned into him, preoccupied by one of those over-the-shoulder checks. Soft yet firm breasts pressed hard against Adam’s chest; honey-gold hair tickled his chin. He steadied her with his hands on her upper arms. And saw tears welling in her eyes. Instantly he released her, took a step back. She gathered up her skirt, ready to run, giving Adam a glimpse of slim ankles above a pair of silk shoes. There was no mistaking the whimper from the runaway bride, nor the flare of panic in her eyes, which were the gray-green of the Mississippi when a storm was brewing. “I can’t go back.” She tried to tug her arm free. Fleetingly, he considered letting her go. But much as he hated this wedding show, he wasn’t about to sabotage it. They were due to go live in an hour, so it was a safe bet people would be scouring the building for the missing bride. In her panic to get away, she’d obviously taken the elevator up instead of down. It might take a while for the search party to reach the top-floor boardroom, but they’d get here in the end. “You can’t leave like this,” he said. “You look terrible.” Oops, that wasn’t the most tactful thing to say to a bride. “I mean, you look great…fantastic.” He ran a quick eye over her to check he’d made a fair assessment. She was a little on the short side, around five-four in her shoes, he estimated, but the dress hugged some very attractive curves. She nodded. Someone walked past the boardroom, and she shrank down into the couch. Uh-oh. This was just what he needed, after he’d worked through the night to get this show into some semblance of order, tying up the loose ends his cousin Henry, the show’s creator, had overlooked. Except Adam hadn’t had time to check if Henry had lined up a replacement bridal couple in case someone pulled out. He’d bet money the answer was no. Any minute now, representatives of the show’s sponsor, Getaway Resorts, would arrive at the studio to see the debut of “their” show. Getaway was in a different league from Channel Eight’s other sponsors; having them on board would bring the station to the attention of the major players. Adam couldn’t afford for anything to go wrong. He can’t have sounded very convincing, she shot him an unbridelike glare. Adam should never have left Henry in charge while he was in New York. His cousin must have had this crazy idea in mind for months, to have set the show up in just four weeks. Adam had come home two days ago to find the station abuzz with excitement about Kiss the Bride. He could have canned it. But then the family stockholders would accuse him of being highhanded again. Better to let tonight run its course, then convince Getaway Resorts to put their money into a higher-quality program. Adam eyed the telephone on the boardroom table. “So you can get me out of here? Off the show?” She stood in a flurry of excitement, a hopeful smile curving her mouth, crinkling the corners of those gray-green eyes, hinting at a dimple in her right cheek. Adam hadn’t missed the vulnerability that shadowed her eyes. The vulnerability that made her not his type. “Have you changed your mind about the wedding?” Maybe he could find someone—a woman, someone happily married, anyone but him—to talk her around. She didn’t look desperate. With her eyes still bright with moisture and her cheeks flushed at the personal nature of the conversation, she looked more than ordinarily attractive, like the kind of woman who would have potential bridegrooms lining up on her doorstep. “I suppose not,” Adam said. Adam groaned. Poor Joe, expected to “adore” this woman for the rest of her days, when if he was anything like most guys all he wanted was a quiet life. Even if he had run off to Charlotte, he’d probably still be on the receiving end of constant demands from his grasping relatives. Did he look like a sucker for punishment? “Good idea,” Adam said. He inched his hand toward the phone. A shock of…surprise surged through Adam, and he forgot about the phone. He stole another quick look at Casey’s figure, to see if he’d missed any suspicious bulges. No sign of a baby—but pregnancy would explain her emotional state. She looked as if she was about to break down again. Adam, inured to tears through years of dealing with weepy female relatives, planned to wait her out. But something about the way Casey’s eyes shimmered, then the way they widened as if to say she wasn’t about to cry, no, not at all, got to him. He whipped his handkerchief out of his pocket and offered it to her. She took it without a word. He read the Emergency Fire Instructions pinned to the wall while he tried to ignore the way her snuffling did funny things to his insides. Eventually he gave up, and glanced sideways long enough to find and pat the creamy shoulder nearest him. At his touch, Casey straightened, drew on some inner reserve to blink the tears away, and met Adam’s gaze full on. “I’m sorry.” She blew her nose one last time. “Why don’t you tell me more about Joe?” Dwelling on her husband-to-be’s good points might cheer her up. For all Casey’s dreams of being adored, Adam would bet the marriage she had lined up with Joe would be a lot happier than one based on some infatuation. He wished she wouldn’t keep saying that. She all but had stars in her eyes as she talked about love and adoring. Besides, if Casey was pregnant, she should marry the father of her child. The pretty-well-perfect father of her child. “Casey!” A voice from the doorway startled them. Adam recognized one of the production assistants. About time. Casey leaped to her feet. “Goodbye, Casey. And good luck.” Whether it was because he knew what desperate measures family could drive a person to, or because he felt unaccountably relieved she wasn’t pregnant, or just because she was dressed in such formal, elaborate style, Adam did the weirdest thing. Instead of shaking her hand, he lifted it to his mouth, pressed a kiss to the back of her fingers. And found himself sorely tempted to kiss Casey Greene all the way up her arm and keep right on going.